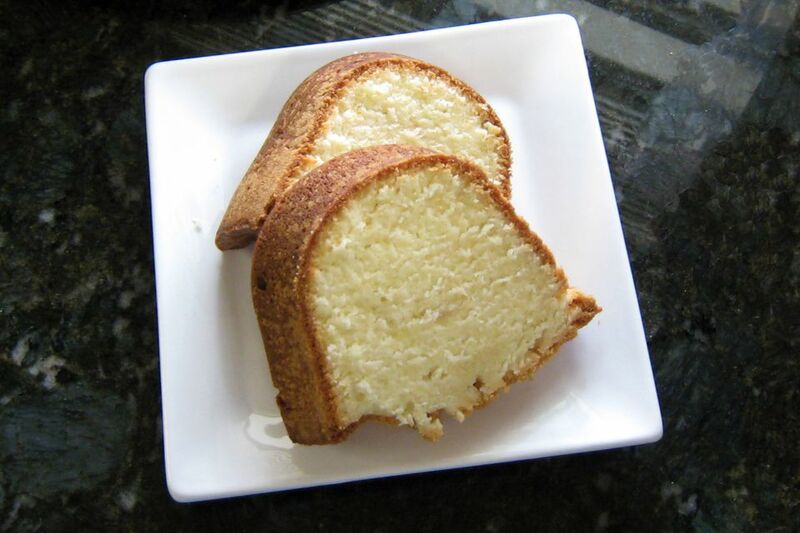 This is a rich cream cheese pound cake, baked in a Bundt cake pan or tube cake pan. I've included two possible glazes — cream cheese glaze and vanilla glaze — but feel free to use another icing or dust the cake with powdered sugar instead. The pound cake would be wonderful with fresh strawberry or blueberry sauce or a lemon dessert sauce. For something a little different, use slices to make this pound cake French toast. It's amazing! Generously grease and flour a 10-inch one-piece tube cake pan or Bundt cake pan. In a large mixing bowl with an electric mixer, beat the butter and shortening until creamy. With the electric mixer on medium speed, gradually beat in the granulated sugar. Continue beating for about 5 minutes, or until light and fluffy. Beat in the 8 ounces of cream cheese until well blended. Add the flour and 1 teaspoon of vanilla; beat just until well blended. Spoon the batter into the prepared 10-inch tube pan or ​Bundt cake pan. Bake in the preheated 325 F oven for about 1 hour and 15 minutes to 1 hour and 25 minutes, or until a wooden pick comes out clean when inserted in the center. Let cool in pan for 10 minutes, then invert the cake onto a rack to cool completely. To glaze the cake, place wax paper or parchment under the rack. In a medium bowl with an electric mixer on medium speed, beat the 1/2 cup of powdered sugar with the 4 ounces of cream cheese until well blended. Beat in 1/2 teaspoon of vanilla and about 3 tablespoons of milk or juice, or enough to make a thin icing that can be drizzled over the cooled cake. In a medium bowl with an electric mixer on medium speed, beat 1/4 cup of softened butter with 2 cups of powdered sugar. Beat in 1 teaspoon of vanilla and then beat in 2 to 4 tablespoons of milk or hot water, or enough to make a thin icing. *To get the eggs to room temperature quickly, place them in a bowl of hot tap water and let them stand for about 5 minutes.